Welcome to Day 3 Crafty October – a month of Halloween ideas at The Purple Pumpkin Blog! Don’t forget to check out last year’s ideas if you need more inspiration. I love designing subway art, it’s a simple thing to create, even when I have no time to sort out other decor for a party or event! 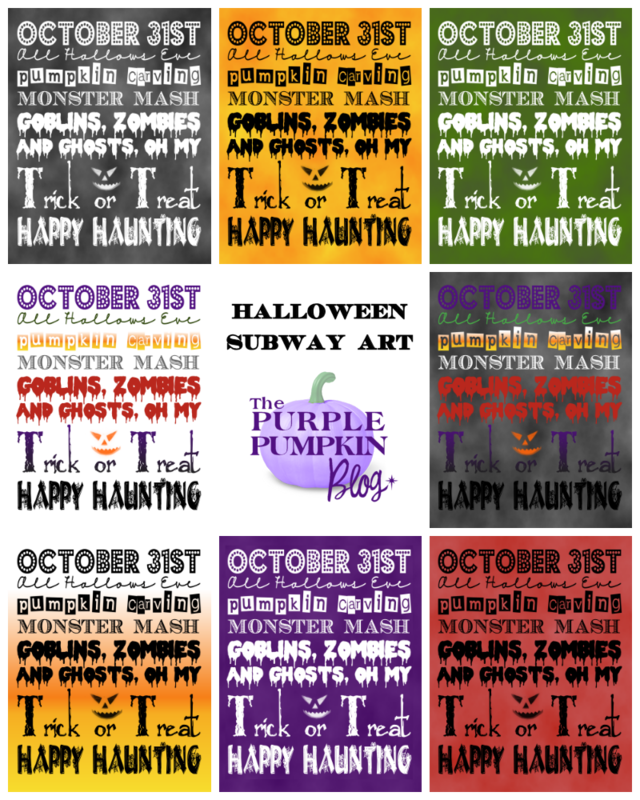 So I’ve created a new set of Halloween Subway Art for you today to download and print! I haven’t got a photo of mine in a frame as yet, because our printer ink as run out – as soon as it’s replaced I’ll be able to show you the art displayed in a frame. The size of the free printable is 8″ x 10″ and I’ve made them in several different colours, with both black and white text, as well as two multi coloured designs. I hope you’ll find one that will suit your Halloween decor! And you can always print off last years design if you wish! Each Halloween Subway Art Poster comes in PDF format (use Adobe Reader to open them), with two designs of each background colour. Just click the links below for the one(s) you want! I am hosting a month long Halloween Link Party to celebrate Crafty October and would love for you to share your Halloween ideas – crafts, recipes, costumes, parties…anything goes, as long as it is family friendly! It’s my favourite time of year, (as you may well know!) and I can’t wait to see what you link up! I was already following you on pinterest but have repinned from your board.